I will start this report with an assessment of my personal skill at refinishing. I have very little skill. I wouldn’t say that I have none, because somewhere there must be some poor soul with less ability than I, but I pity him or her (probably him, don’t you think?). I am the type of craftsman who makes basket-case projects for others with real skills. I’m the guy you want to know if you are a careful worker, because I will output loads of projects that require your skilled hands to put right. While this may sound like a humorous introduction, laced with humility, it’s also possible that I’m just being honest. Some men build ships in bottles. I break bottles. Some men install cabinets in their wives’ kitchens. I hire them and go to the movies. Now, I do know a few things about airguns, which is why I write about them. Years ago, when I began writing, some people took offense that a complete unknown would dare to write about a subject they had pursued for many decades. That resentment has sort of died away, now that people know that I not only make mistakes when I write, I actually draw attention to them when I find out! So, I get to write about airguns. I even get to write about how to tune up certain airguns because I’ve done it many times, made most of the mistakes that can be made and tell my readers about them as I go. But I’m about the last person you would seek when you need help refinishing your gun! I hope you believe that, because it has everything to do with the report you are about to read. Volvo was discussing the use of cold bluing solutions and several readers chimed in with their personal experiences. I did, as well, though being the hack that I am, I was offering the advice of a blind guide. However, the discussion did stir my curiosity regarding one cold bluing process–Blue Wonder. I have seen this process demonstrated in person both at the German IWA show and also at the SHOT Show in Las Vegas. The man who demonstrated it both times was the founder of the company and very smooth at doing what he did–which was to refinish a piece of gun steel in public. I remember standing there watching him work and marveling at the results, like a farm boy at a county fair. Of course, the hype on the clamshell package says, “No special skills required!” but after learning years ago that, indeed, girls DO care about certain things (let the reader understand), I don’t believe everything I read or hear. However, in this situation, I bring to the table an all-important quality that is certified by decades of demonstrated results. I have absolutely NO special skills. Who better to demonstrate this “marvel” cold-bluing process than me? Heck–even I’m interested to see how this will turn out! Blue Wonder cold blue system comes as a three-part package. You get cleaner, bluing solution and developer. More-or-less, I followed the directions. I didn’t want lectures from those more skilled than I, so I tried to do things exactly the way Blue Wonder said to do them. Where I departed from the directions, I’ll tell you. I have a Daisy No. 25 pump gun receiver that’s red with rust. I’ve been saving it for years, just for this experiment. You know how people are. Out behind the shed is a pile of rusty iron that Bubba is saving for a rainy day. Only it never rains and Bubba’s relatives sell off a $10 million 1920 Hispano Suisa cabriolet for scrap at the estate sale. I haven’t got one of those, but I sure do have this rusty old Daisy pump. An overview of my rusty Daisy No. 25, which my wife correctly identified when I handed it to her! Eat your hearts out! I’d call this a rusty BB gun, wouldn’t you? Yeah, yeah, yeah! Okay, so I rubbed the rust with OOOO steel wool for about 30 minutes. To placate the folks from Blue Wonder, I saturated the metal with Blue Wonder cleaner. The rust went away entirely, but it left the metal with an etched surface that didn’t shine very much. If I had wanted the metal to shine, I would have rubbed it with car polishing compound. But I didn’t do that, and that’s important to keep in mind. This is where I deviated from the Blue Wonder instructions, but I can’t see how I did anything bad. After getting all the rust off, I cleaned the surface to be blued with acetone several times before moving on to bluing. That was to get rid of all oil and grease. To apply the bluing solution, which must be shaken in the bottle before every application, you first heat the metal with a propane torch. The metal must be hot to the touch, but not hot enough to burn you. Good luck with that one! I just heated it up and guessed! The bluing solution is deep blue/black in color, and, unlike other cold blue solutions, it goes on dark black and then gets lighter as it dries. The other cold blues go on clear and slowly color the metal darker as you repeat applications. Blue Wonder needs repeated applications, too, so I put on five coats of solution, leaving the final one wet for a minute. Then, I dried the surface and applied the developer. The instructions say to use between 5 and 15 applications. The developer both fixes the color and deepens it over the course of 1.5 to 3 hours. I left it on the full three hours, then I dried off the surface and sprayed it with Ballistol. The directions call for a high-quality gun oil with good rust protection, and Ballistol is the best I know of. You’re going to have a hard time believing this, because I have a hard time and I was there to see it happen. The system worked exactly as advertised and left me with a beautiful finish. No, it’s not perfect, because I didn’t polish the metal perfectly. Remember? But the finish is better than I have a right to expect considering how easy it went on. Here is a detail of the area I was working on. There are no lighting tricks or Photoshop tricks used with this picture or the next. The lighting was the same for both pictures. And this is how it looked after I was done! So, does Blue Wonder work? I’m not ready to say, yet. It sure looks like it does, but let me try some other tests before we get excited. However, I have to comment that, up to this point, this is the best cold bluing job I have ever done. bluing, for me,is handling and time. BB, when you say you dried the gun, exactly what did you do? Wipe it down with paper towels or use a heat gun (perhaps a hair dryer)? Your job looks pretty good but as JT stated, how does the finish stand up to repeated handling? I have another test that may show repeated handling. I have to say…wow…nice job BB!!!!! If it holds up..then way to go Blue Wonder!!!! Here's my disclaimer: "I'm not an expert on cold bluing and don't play one on TV but have made a lot of mistakes in trying to cold blue firearms. Never used cold blue on an airgun. Some of my mistakes took over a year to discover. Your goal in cold bluing has to be clear. Do you want a finish as nice and rugged as possible since you still plan to use the gun or do you want to cover up rust and pitting so the gun looks good from a distance while it hangs over the mantle. This is not to be construed as a lecture in any way, shape or form but merely my two cents." An extremely rusty gun that only has slight traces of bluing remaining is a candidate for stripping. Start with naval jelly and work up to 600 grit then finish with 0000 steel wool. If the finish isn't bad, just thin with a little rust, then use oil and 0000 steel wool. Don't use car polish or rubbing compound since it's almost impossible to remove all the residue prior to bluing. Degreasing is important with most cold bluing products I've used (less so with Oxpho). The blue wonder cleaner is good stuff and works better when heated and left on for up to a minute especially if you have pitting. Degreasing with MEK worked best for me. Acetone leaves a film and alcohol attracts moisture. First coat of any cold blue is critical. This is your foundation to build from. I've had most success with Oxpho and get the metal very hot for the first application (the cream will sizzle when applied). Carding between applications is also helpful since you're helping create a rougher surface for additional applications to adhere to. Card with 0000 steel wool and eventually with paper towels between applications. Let dry between 5 applications. Final cold applications, carding with paper towels in between, can provide a glossier finish (up to a point since this glossiness is dependent on prep). If you prefer a satin finish card the last cold applications with 0000 steel wool. Is it safe to dry fire a Talon SS by removing the air tank first? Well, I have another experiment planned that will show how the blue holds up over time. Of course, that one will take time, but we have that. Don't get into the habit, but one or two dry-fires will not hurt and AirForce rifle. But out of curiosity, why aren't you just grabbing the cocking handle and pulling the trigger, then riding the striker down? That is the approved method of de-cocking the gun. The most important thing you did has been unspoken. You mentioned in the article that you bought the 25 just for this type of test. You have 27 other model 25's for shooting. Everyone should buy a gun to practice bluing on instead of using your prize gun as a test bed for your first bluing attempt. It has long been my hope that I would refinish this receiver and eventually the front part of a 25 super-nice, so that one day I can hold my head high like all the real craftsmen do when they show off something they did. Up to now my best attempt at art was an ashtray made in summer camp that looked remarkably like what it actually was. At least with this rusty receiver I have plenty of practice space! Since you're in rare form today I have a question. In the article, regarding special skills needed, you said , "girls DO care about certain things". Is this going to be part of your "test on repeated handling" that you promised? Can you also provide some video footage? Anxiously looking forward to part 2. I honestly thought I took that out. In my limited experience you always have to take them out. You left out buying dinner, etc. A question please, how would you match the cold bluing to the bluing that's already on the gun? I'm thinking about the holster wear on the front of a pistol barrel. Also, would an electric hot air gun, like the kind used to strip paint, work better than a propane torch for heating the metal? I cannot tell where the cold blue ends and the hot blue begins. It is a perfect match. It also doesn't smell like cold blue. One of the first things I do when evaluating a gun that has some value is smell it to see if there is any cold blue. A heat gun should work well for this. Wish I'd thought of it. For large areas, when permitted, an oven works best. A heat gun works and so does a propane torch. I've read where people use hairdryers. That, in my opinion is a waste of time since the application of cold blue can't be set. Matching bluing is tricky. Blue Wonder comes in blue and black for that reason. Oxpho paste is blue but can be built up to almost black but unlike Blue Wonder (that goes on dark and dries light) you can tell where you are in the process. Birchwood Casey is grey. I caught the new episode (at least I think it was the new episode, they seem to air on Monday right?) of American Airgunner. This was the episode with Mike (I think) from Noteworthy Targets. Those are nice targets by the way.. Anyhow, I noticed that the Discovery that Crystal was shooting seemed to have the barrel band moved forward from where it comes stock. Was I just seeing things or did you or Paul do that intentionally? There is a lot of discussion about that barrel band and I'm wondering if you have any insights from your experience on the show? Personally, I find that I can wiggle the end of my barrel by hand, but as long as I'm not wiggling it during the shot it's pretty accurate, so I haven't moved mine. I'm really enjoying the show by the way. The episode about tuning the RWS 34 was great. I remember some time back you and Paul went to a wild game ranch in Texas. Did that episode already air or is it in the hopper? I'm curious how much hunting you guys will cover? The Sportsman Channel has non-stop shows that play footage of game being shot. I would think that is probably a big draw for folks who watch the channel. I'm curious if you guys have thought about trying to "ride some of that momentum" so to speak. I'll keep watching regardless, but it may be a way to pull in new viewers. I hope you don't take this as being critical at all, I'm sure you guys have put a great deal of thought into the show's content, I just want you to do well. I'd like to be watching American Airgunner for years to come!! Word verification is hairtic – as in I can split a 'hair' or shoot a 'tic' off a hounds hide with my disco!! OT…anyone know of a sling that will somehow work with the Crosman Nightstalker? Nice job. Looks professional to me. But propane torch? I'll leave this one for someone else. 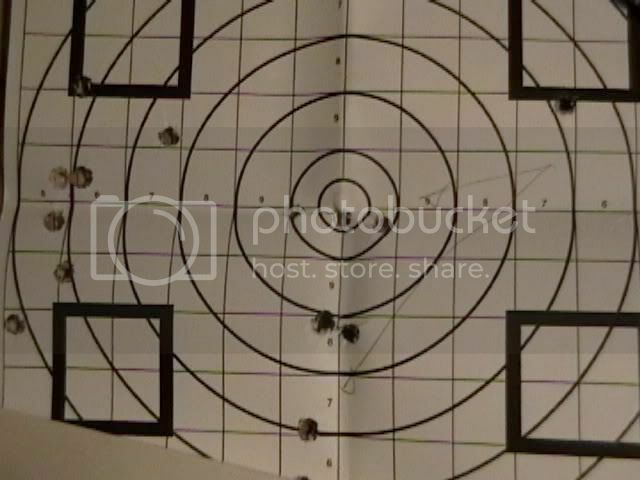 So, here's my 1911 target at 7 yards from this past Saturday. Note the pronounced vertical stringing of the center group. However, there are signs of hope. The upper arrow points to shots with follow through, the lower arrow to those without (i.e. flinching). It was very obvious to me while shooting. Last time, I was consistently low with the sights at their lowest. I raised the sights 3 clicks and got some one target this time. The push moves on. Sorry, but Crystal's Discovery is box-stock. The hunting footage in Texas will not make it into an episode. We shot that is standard definition and all the episodes now are shot in high-def. Sportsman's Channel is not broadcasting in high-def. but we are making all the episodes that way. An add-on to Aaron's question. I noticed that the bottom set screw for the Disco barrel band can make a nasty mark on the air tube. That doesn't seem like the best thing to do on a pressure vessel. It seems like a good solution would be a barrel band with the metal left between the barrel and the air tube for spacing. Then a set screw would only be installed on the barrel side. Has Crosman thought about doing that? If they have they haven't consulted me. Because of our previous conversations concerning proper gun storage, I can see that this article will be essential to me in a year or two. Or if this link doesn't work, do a search on PA for rifle slings. I like the Leapers 3-9X50. Yes that ding in the pressure tube and barrel is a finish killer on the Discl… especially if you want to play with moving the band around. Solution… cut a small piece of plastic from a soda bottle and use it as a shim under the screw. As long as you only tighten gently the finish stays unmarked. Took your advice and called PA. They recommended a totally different bi-pod for the Disco. Ordered it yesterday. Have to mount a sling swivel set to make the bi-pod work. Was wanting a sling anyway – so not a problem. Thanks Fred, that looks like it is perfect. Have already place my order thru Pyramid. BB answered but I have other thoughts. Depends on your goal and the intended gun. Not all scopes fit well on break barrels… right Herb. I have had four low cost scopes in the past two years. All are good for the price. But all work better on different guns and would not work at all on some guns. Diso has a Leapers 4-12×44 30mm tube – it is great with side AO. Daisy 953 has a Leapers 3-9x32AO Bug Buster Compact. It is perfect for small low to medium power rifles. The 953 will be shedding the scope next week in favor a peep sight. I also have an older Leapers 3-6×50 without AO. They no longer sell this model and it is a great paper weight. A 22 rimfire simi-auto now sports a Winchester 3-9×32 purchased from PA. It is very low cost and worth every penny for the task given to it. Do your research – that is half the fun. Good project. You could almost have rust blued it originally:). I wanted to do my Red Ryder at one time, but then I got to looking at it and can remember where many of the streaks and gouges came from, so I just oil it up:). I assume you are going to do the stock pieces and wow us, also:). One note: on those smooth edges, I wouldn't be afraid to use some fine sandpaper, wrapped around a chop-stick or pencil eraser or whatever fits the contour if you have trouble getting the steel wool to conform. Nice procedure. Your acetone must be different from mine — it evaporates fast and leaves nothing but a slightly elevated mood:). For most cold blue, I wouldn't worry too much about alchohol's hygroscopic nature, since they are generally watered down acids (e.g., selenium dioxide in an "aqueous solution") with other "stuff". Wacky Wayne is coming to my house tomorrow. After that, I will ask him to verify that I don't have time for any more projects–except maybe to move into them! I tried cutting patches at the bore today and had some mixed results, but I was too lazy to cut more rounds, so I just cut small squares, which for some reason seem to shoot even better than the rounds. Works for me — economical and easy:). I knew it — Wayne was living the dream, and it (actually his wife) caught up to him:). Don't try to cut your patches too small, and be careful to keep the patch and ball centered as you start the ball. If the ball ends up too close to the edge of the patch, the pressure applied to start it will cause the weave to seperate and cause a weak thin spot in the patch…..off center ball and burned or blown out patch. Keep an eye on the spent patches. A lot of short starters set the ball in farther than necessary. This causes excess patch in front of the ball that may interfere with ramming, and clean release of the ball when firing. The short starter should leave the ball just flush with the muzzle. Also…try to start the ball straight down . If you roll the ball around when starting it, you will deform the ball and blow the accuracy. The ball only contacts the rifling (indirectly through the patch) in a very narrow area. The contact must be kept clean and symmetrical as possible. Christmas is coming and it's time to decide what to buy for myself. i'm thinking of an R9 but i have some questions that i want the opinion of a pro to help answer. first, which scope should I buy? i want to use the gun for general use, and i'm tied between the Leapers 3-12×44 SWAT and the 4-16×56 SWAT scope. general use involves plinking, long-range plinking, target shooting, probably light hunting, and probably some camping. which scope would be better for it? and second, what mount would mount the 3-12×44 scope closest to the rifle without hitting the rifle, should i choose to get that scope? would AccuShot medium mounts fit the scope on the R9? or should i go with high? and finally, for the uses already stated, should i get the gun in .177 or .20 caliber? The way I used to cut patches may sound unorthodox, but it works. Drive the patched ball a short way into the bore–deeper than flush. A short starter has two lengths of dowel on it, one long and the other short, just for this. With the ball seated 3/8" down the bore. Pull the edges of the too-large patch straight up, gathering all the corners as you do. Now, slice them off at the muzzle, using the flat muzzle as the guide for the knife. Your patch knife should be razor-sharp. I made my own from a file and it was always sharp. I got great accuracy, as long as the patch material was compressed well. Compression of the patch material is a big issue in accuracy with a ball-shooter. The more the better, so long as the ball doesn't get so tight that it deforms from the short starter. I always load sprue up, too, though with swaged balls there are no worries. Oh, boy! Too much responsibility. .177 is better because of the large number of pellets, but Crosman does make a .20 caliber Premier. For hunting, the .20 is better. But I think .177 is best all-around. I like the idea of the 4-16 scope. You'll never regret that extra power. As far as the mounts go, please ask the tech reps. I think with a 56mm objective you will need a high mount, but let them confirm that. Do we save false muzzles and mechanical starters for a different time?? I have the Leapers 3-12x44AO (Item: SCP3-M3124AOMDA[PY-A-818]) and love it a lot. Plus it it about ten tins of good pellets lower in price. No doubt the extra power of the 4-16would help if you want to drive nails at 50-yards. Yes, I think BG_Farmer might shoot off the false muzzle a couple times before he gets used to it. Might need one of the long red streamers that we had on aircraft…..
Maybe one on the ramrod too. With my luck, it's either going to be strip and paint and use lots of camo tape or just buy a new airgun. I'm glad you called Pyramyd Air. Nothing worse than assuming it works, finding out it doesn't, shipping it back then waiting for the right one. Tech support at Pyramyd Air have always been very helpful and knowledgable in my experience. Thank you very much for sharing your procedure. Reminds me of your R-1 book which I enjoyed, a sort of learn as you go. Don’t fear for the Walther 55. Remember my criterion was for a 90% gun that was a shooter. It is not a pristine collectable. The line about the ladies could just have well come from one of my stories. I fear I’m rubbing off on the big guy. Wayne don’t shoot BB’s eye out!!! Know what you mean about the acetone. MEK is better. More like two fingers of scotch. Aaron, the reason the barrel band is moved out is due to migratory patterns. During the late spring to summer months the barrel band stays close to the stock for mating and plentiful food supply. As fall approaches they move south toward the muzzle to stay warm. Seriously though, if you watch the Paul Capello videos of the Discovery you will see in the first episode the band was in the normal position close to the stock. Paul comments that there needs to be an additional band. In the second episode you will see the band has moved out toward the muzzle, like on Crystal's Disco. Perhaps Ms. Ackley is borrowing Paul's Disco, or maybe she just has sticky fingers. Keep an eye on your gear Paul! Maybe Crosman just puts them there now. I got mine little more than a month ago, and the band was in the standard location, but the rifle could have been sitting in a warehouse for a year. I ordered a second barrel band from Crosman, $2.66 I believe. I think it looks much better, and I don't worry about the barrel getting bent anymore. I think you're being humble again. I saw the pictures. Wish all my guns were 90%. Slinging Lead – Ah yes, I forgot to consider the migratory patterns of barrel bands! I rewatched the show and the barrel band on that gun is definately farther down the barrel than the one I also got about a month ago so maybe Crossman is putting them there now. Either way, I'll stick with the one where it is at until I see a reason to change. BB, try it on some other kinds of steel. It worked very well on an old Crosman barrel, but it was awful on a new .25 LW barrel blank. Despite following the directions exactly, it turned out with an ugly gray-green tinge. Thanks for the suggestion! Good idea! I'm not just concerned about the finish, but also about the safety of the air tube. Marring the air tube makes it less safe for holding high pressure air. The muzzle brake came today. I was concerned about the quality until I saw the product. Very nice! All blued steel. Wow. It was $15 plus $4 shipping. Snug fit, but the finishing touch the 55 has been waiting for. When if I attempt the bluing, it will just be a spot repair. For all the barrel harmonic fans, when I took the 1 lb + sleeve off the POI changed dramatically. With the brake it changes a small amount. However overall accuracy seems unaffected. Yes, keep it simple…I'm already overly compulsive. Have often uncocked to check (again) that ramrod is not a subcaliber load:). And tested my bullet-puller (I'm afraid to use the real term the way people are today) twice:). Yes, I suspect BB found out one of the benefits of finishing work, the chemicals make you happy:). NOTE FOR THE HUMORLESS: always use proper ventilation. That's some serious chemical — proud of you:). If you like bourbon (scotch will do the trick, but there's better alternatives), I've run across a real nice product: Woodford Reserve. My wife took her parents on the distillery tour and brought me home a jug. I don't generally go for the fancy stuff in any department, but I've got to admit its the best I've had since Jim Beam started aging their stuff beyond a happy youth. "NOTE FOR THE HUMORLESS: always use proper ventilation." My Disco barrel band migrated too. It is now about 6 inches from then end. Seems to like it there. I have 2 years or so reading your blog. I learned a lot on airgunning, and some other stuff too, for which I have no words to thank your selfless help. My father teached my brothers and I to shoot with springers when I had 6. He taught us to do shooting in a responsible way; just all he does his living. He taught us with his favourite, a Fwb 124 Sport he bought to Robert Beeman in 1980. I came across this blog when looking for some info about this rifle. And I found much more than that. I have it fixed (seals wore out) and now it shoots just as new. I learned in your blog how to shoot it better, how to 'scope' it, and what it is capable of. The rifle is just as new, with no single scratch on it. The people that have seen it asked me if it is new. My father also taught us to take care of it. I still have that old can of Sheath that came with the rifle, and use it every single time I use the rifle. I also have a few cans of the Beeman Silver Jets I love so much. A group of friends and I created a airgun shooting club a year ago, we made or own silhouettes and are beginning to do some FT. Of course, we are mere weekend amateurs, but we progress slowly. A guy friend of mine is very fond of tuning Discovery's; another ones bought their AirArms, one guy got a Sumatra, another guy got an EV2, another one a Rapid, and so on; all of us are glad to practice and make friends at once with our sport. It couldn't have been so succesful without the knowledge we got so easily from your blog. Now, along with the Fwb my father passed me, I have a Benjamin 392, a nice Fwb 601, and a Crosman 1377. In my country is very hard to get many airguns, and even if they're available, they're pretty expensive. Most of people here have to stick to Gamo, Diana, and Mendoza. Only recently Crosman came out with the Disco, Marauder, and very few distributors can sell Sumatras, some Evanix, a few AA, and the Umarex line reliably. I still shoot gladly my 'old German' fwb 124, I am also glad to comment my old man about the things I read in this blog about air and firearms. Airgunning has grew quite a lot the last decades, just like my knowledge on it (and myself) did. ok thanks B.B. that's about the same conclusion i was leading toward. i know for a fact that the Accushot high mounts in 30mm are pretty much the best thing for the 4-16 scope, as it has a huge objective lens. i wanted 2-piece rings because i'm growing tired of the huge weight of 1-piece mounts. i've already mounted a very heavy scope, on a heavy Beeman/sportsmatch 1-piece high mount on a very heavy Beeman SS1000-S, so i wanted some things to change (the SS1000-S is so heavy that there's not much felt recoil and you can forget offhand shots). so i wanna take advantage of the R9's already fairly light weight and preserve every bit of it, while still having a nice scope to put on it. i don't like it when i start sweating from the strain of trying to aim a heavy gun offhand at a small target. it gets tiring after a day of shooting. Hmmm…Woodford Reserve. That's a new one. I'm not very particular. Can't usually afford labels that say "Reserve" anywhere on them. Send me a tin of that stuff. Welcome! Glad you finally spoke up. Sorry to hear about your father passing. Sounds like he was a great man. You have one of my favorite spring guns, an FWB 124. Yours sounds like it is in much better condition than mine. Don't know why I addressed my comment to Volvo since it was meant for you. I haven't even had a drink tonight so I don't have an excuse. Please forgive me. I need to take a break. I do have several airguns and one firearm to try Blue Wonder on. It will get a thorough test. Welcome to the blog! Of course you have been here for years, so I am really welcoming you to the group who make comments. My wife, Edith, welcomes you as well. We both hope you will be making many comments in the days ahead.